A Houseworks innovation has fine-tuned the concept of battery-operated dollhouse lighting! 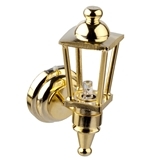 This well designed, high-quality brass/metal fixture has a smaller battery case which unscrews to access a smaller battery. The 3V lithium battery which is included is replaceable with #2300. The 3V lithium battery will last approximately 50 hours. 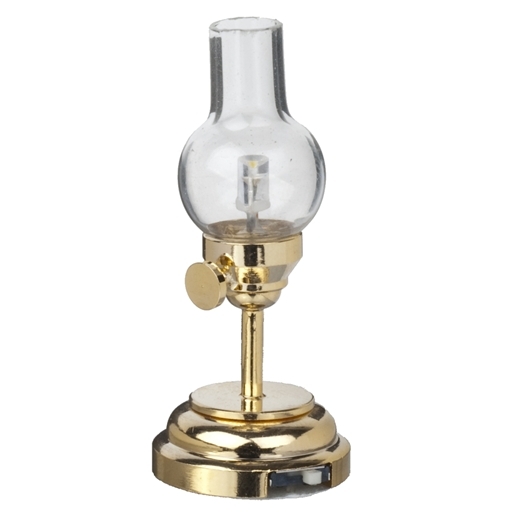 The LED is not replaceable but will burn for about 4,000 hours and put out much less heat than traditional bulbs. 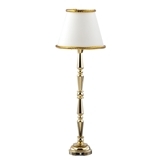 The Tipton Hurricane Lamp is brass with a clear glass shade. Click Here for more information on LEDs. . 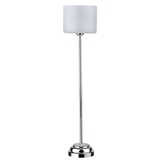 This is a beautiful lamp. Displayed in my Lighthouse. Very classy and well made. Love the light but when the package arrived the battery was dead. No warning in the description that the sealed packages may have rundown or dead batteries.